This series of blogs summarizes key takeaways from some of the presentations and panel discussions offered at the 2009 Social Commerce Summit. 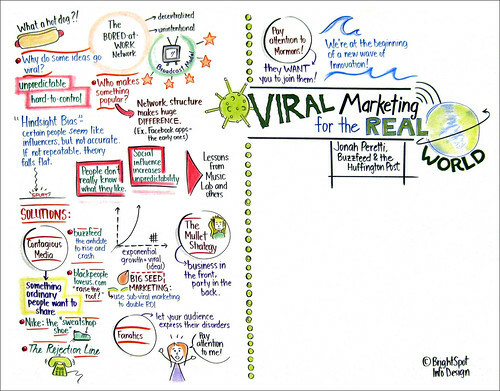 “Viral Marketing for the Real World” is the keynote given by Jonah Peretti, Co-founder, BuzzFeed and The Huffington Post, on April 28, 2009. Ever since the days of kickball and school fads, people have wanted to know: Why do some ideas spread while some die? Can one influence what becomes popular? This session offered five tricks for spreading your ideas online. The key concept behind information going viral is the Bored-At-Work Network. Millions of office workers around the world share content of interest all day, every day. The Bored-At-Work Network spans a far wider range than the BBC, CNN, or any traditional media network. Because it doesn’t function within an official structure, the decentralized network enables media to flow uninhibited through the hands of ordinary people. Information becomes newsworthy based on the lone criterion of popular interest. So if the public is in charge of today’s media, who wields the power to decide what’s popular? “Accidental Influentials” are people who wield significant influence through their connections and networks. Early Facebook applications went viral because they were designed to show up to all of your friends and could be shared easily. One negative aspect of viral networking is the lack of censors verifying the accuracy of shared information. At the time of this presentation, swine flu was the latest alarm around the world – yet how many people actually know much about the disease itself? Most of the information disseminated across social networks deals with how swine flu is spread, or about tourist traffic to Mexico – relatively little is actually known about the disease. Hindsight bias affects our understanding of pop trends. The problem with hindsight bias lies in the fact that the same actions cannot reliably be repeated in the future. So perhaps the Influentials weren’t really the fad catalyst. People don’t really know what they like. The Web is still confusing, intuitive and unpredictable. So once again, we’re back to the original question: How can one influence popularity? Viral content carries the most impact when personal – whether through stories about relationships or how to deal with your kid going to college. These shared experiences create a common bond between ordinary people, offering automatic appeal. Create something that ordinary people will want to share with each other, and format your media for the Bored-at-Work Network. When Tide promoted its cold water detergent campaign, the company offered a million free samples which could only be obtained through a referral system. Customers signed up for the samples, and then alerted their friends through word-of-mouth. Tide utilized P&G’s huge email list for this promotion, which drove traffic to their page and helped them acquire an extra 40,000 subscribers without an elusive tipping point. Mullets are all business up front, but party in the back – which is good Web strategy as well. The Huffington Post features serious news on its front page, but its content is actually user-dominated. While visitors click through the site, The Post analyzes real-time data to see what is really important to readers, and stories that get clicked on more often bubble up to the top, receiving more promotion and thus getting big-seeded. Help your audience fully express their personality disorders. The key to success for blogs, YouTube, and Myspace lies in histrionic/narcissistic personality disorder. OCD Web users are crucial to the success of user-generated sites such as Wikipedia or del.icio.us. When it comes to the Web, those who get engaged can be a little crazy, but they get things done. When it comes to marketing, emulate the Mormons. Traditional Judaism has nothing on the Mormons. Mormons are key marketers – they want you to be Mormon, so their ranks are steadily growing while Jews are declining. For 2009, why not set a new project goal for your organization? Create a new kind of viral advertising. Put the good stuff up front. The key to viral media is bringing in outside traffic. Then only spend money promoting the winning content. We’re at the beginning of the wave of innovation. Viral media is just one small piece of the puzzle. The Web allows a new level of engagement, transparency and participation. There’s no turning back.